After ragging on myself and my feelings about my small (672 sq ft) house recently, I want to expand on some of the reasons why I really do love this house. This is the third post in a series discussing what I love about our house. This is one of my favourite pieces of art in my house. We bought it on our honeymoon and I just love it. It'll probably go into a nursery someday but until then it looks perfect on the brown wall. I particularly love the little owl hanging upside down. He makes me smile. The second piece of artwork hanging in our office: this lighthouse print. The Outer Banks are one of my family's favourite vacation spots. This print brings back happy childhood memories. And my last favourite piece of this room? Our camping wall. 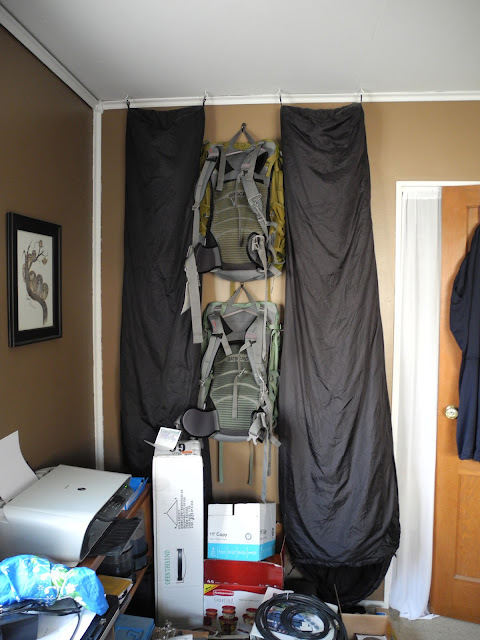 We have our sleeping bags hung from the ceiling to prevent them from crumpling and we had no shelf space for our bags so up they got hung as well. Our tents are tucked into the corner there and it's all very tidy. So there you are. My favourite parts of the office!